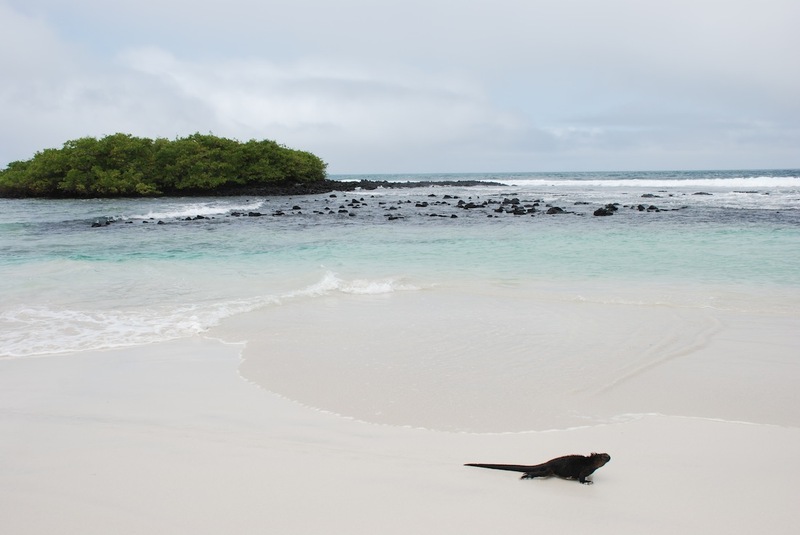 The Galapagos Islands have to be on every travellers, diver or nature lovers life time bucket list, however it’s often perceived to be only available to those who can spend a few thousand on a cruise to see these spectacular islands. 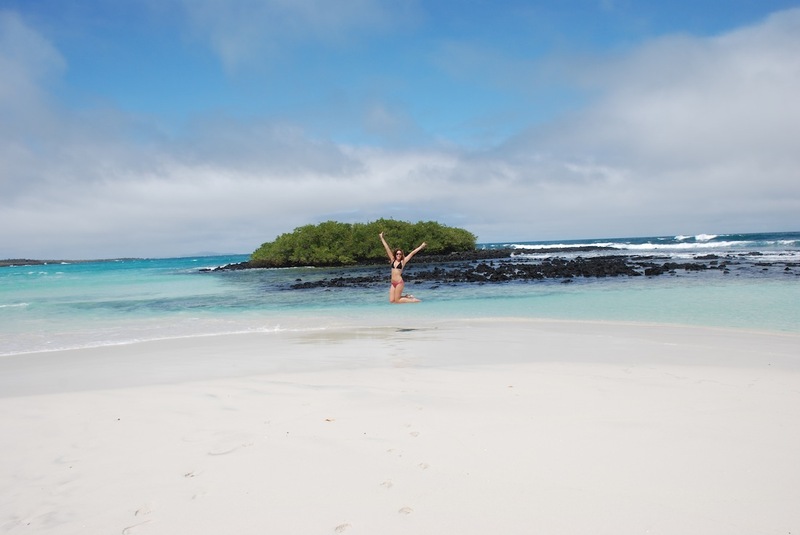 And that’s on top of the flights to Ecuador, US $300 flights over to the islands and US $100 park fees! With that said whilst we were travelling in South America last year we were pleased to discover that by choosing to avoid the costly cruise and to base ourselves on a couple of the islands we were able to visit at less than a quarter of the cost and gave ourselves more freedom to make up our own itinerary on the islands. 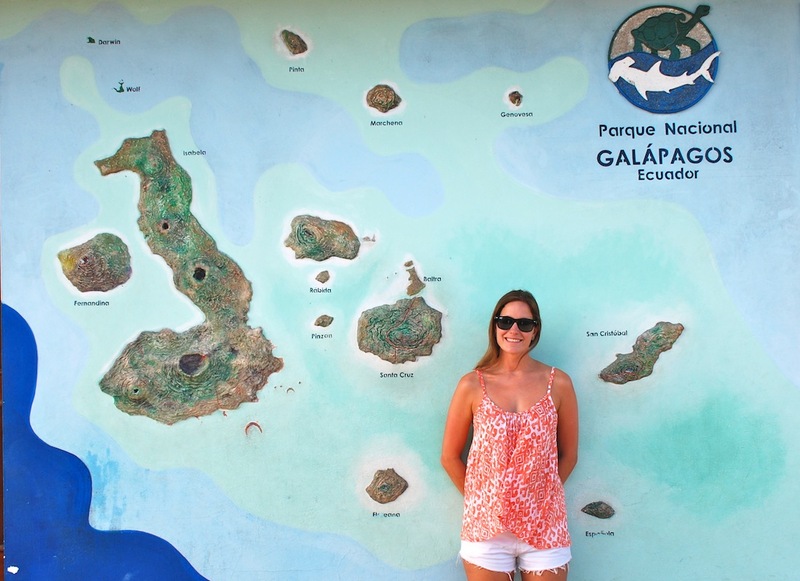 So here are my top Galapagos tips from our time spent on Santa Cruz and San Cristobal. We spent a month or so in Ecuador before making our way to Quaquille to fly over to Santa Cruz. You can fly from Quito also, but since we had come to the south of the country this made sense for us. The flights are standard $300 and don’t really change so timing your booking is not too important. When you arrive on Isla Balta, Santa Cruz you can jump in a taxi (white pick up truck) to the main town, which takes around 30 minutes. We spent our first week based on Santa Cruz, as there are lots of great accommodation, restaurant and activity options. But if you want to travel over to another island boats leave everyday to Isabella and the other main islands for around $25 – $30 from the port. We booked to stay at The Red Mangrove Aventura Lodge. The hotel is at the far end of the Avenue Charles Darwin, and the main street of restaurants, hostels and hotels. 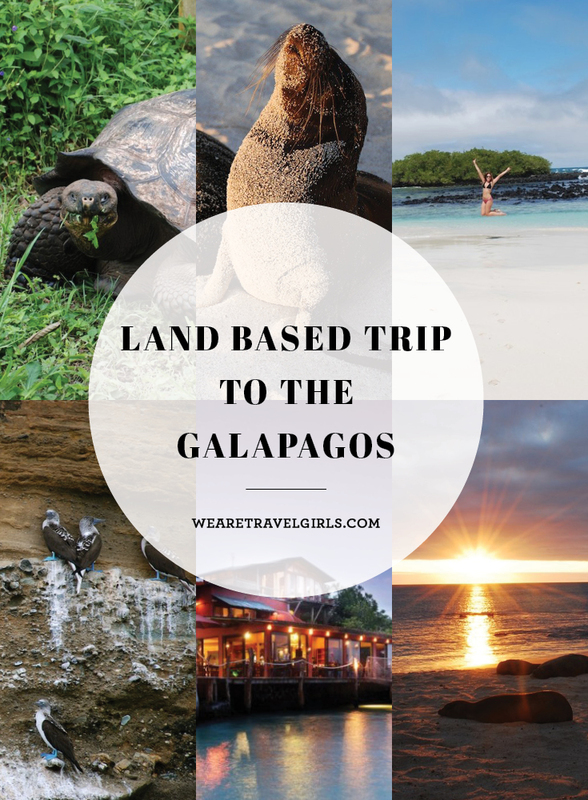 We had decided to splash out on our accommodation in Galapagos, but there are plenty of hostel options ranging from US $20 per night to choose from. The hotel was beautiful, the rooms are spacious with stunning views out to the ocean. You can’t beat spending watching the sunset from the hotel dock in the company of sealions and iguanas, be warned they take priority over the guests when it comes to where you want to sit! The lodge is an easy walk to the docks, restaurants, the Darwin Centre and was located right next door to our chosen dive center Galapagos Divers, which made it a bit easier when we had the early morning wake ups! Charles Darwin Research Station The Darwin Centre is a must visit whilst you are on the islands. 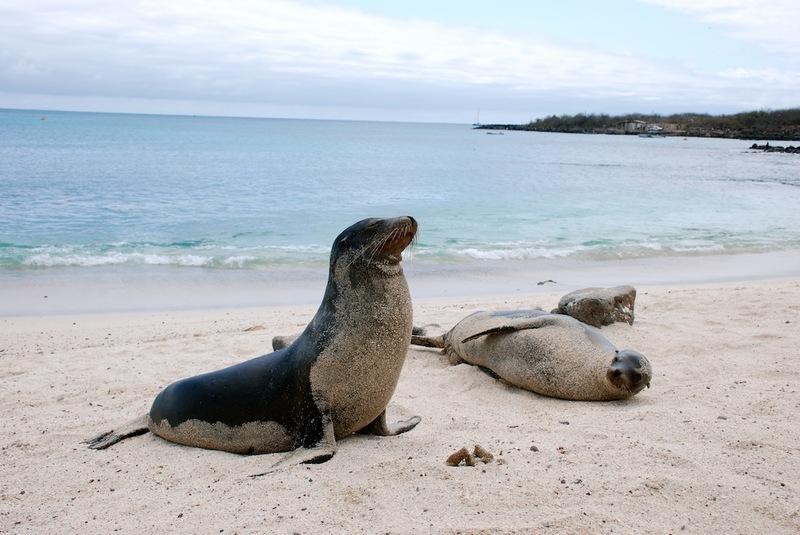 The centre is a scientific non-profit organisation with the purpose being to help with the conservation of the Galapagos Islands. 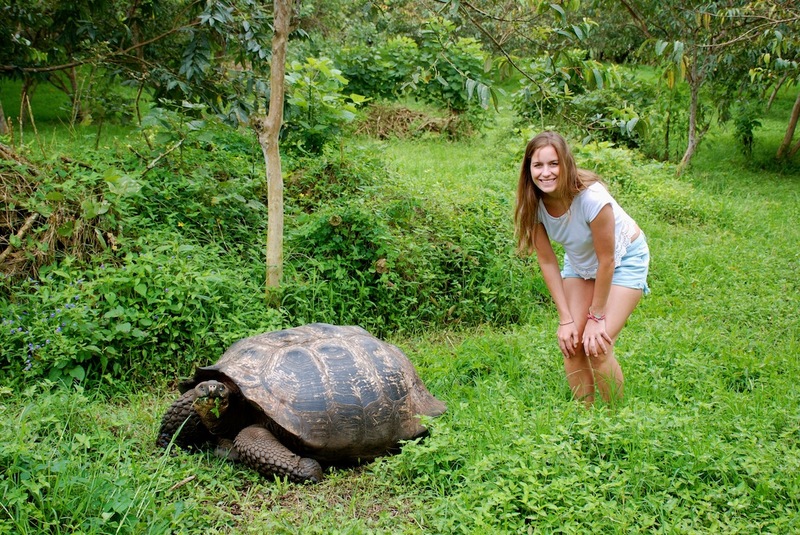 In doing this the centre provides an interesting history for visitors on the discovery and first settlers to the islands, coupled with a few giant tortoises. No need for an organised tour, grab a taxi and your driver will take you to see the giant tortoises and be your guide as well. When you get there be respectful and approach the tortoises from behind slowly and quietly, although you may not like it if someone sneaked up behind you the tortoises are happier to pose with their heads out if you do it this way. Back at the main centre you can test your strength by getting in a tortoise shell and see how much these guys are carrying around all day. It may look easy, but trust me it isn’t! 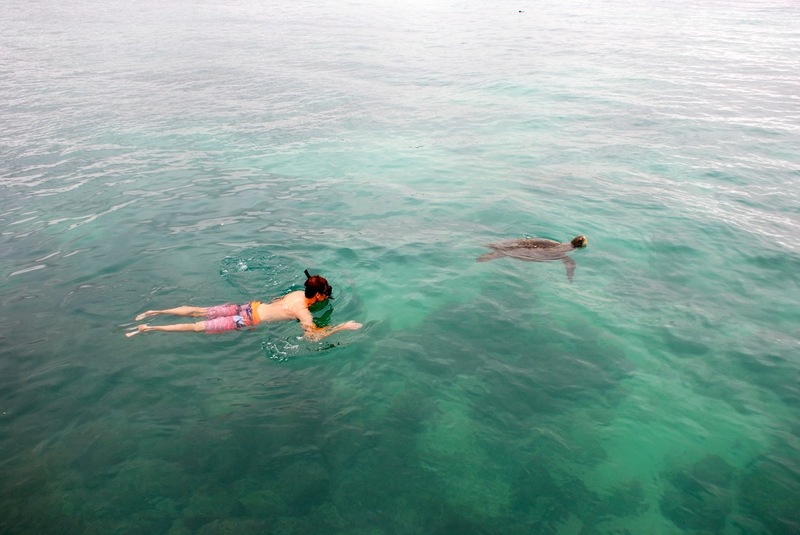 Most of the tour operators offer this day tour around the bay. 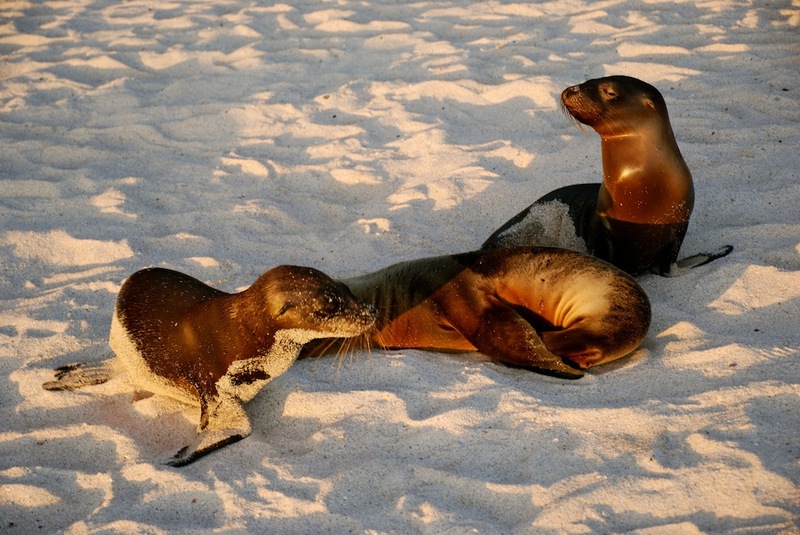 You begin with a boat trip out to see the sealions and if the water is calm enough you can take a dip with these puppies of the sea. Next stop is Las Grietas where if you are brave enough and can scale the cliff and take a jump into the freezing crystal clear water below and snorkel amongst the parrot fish. 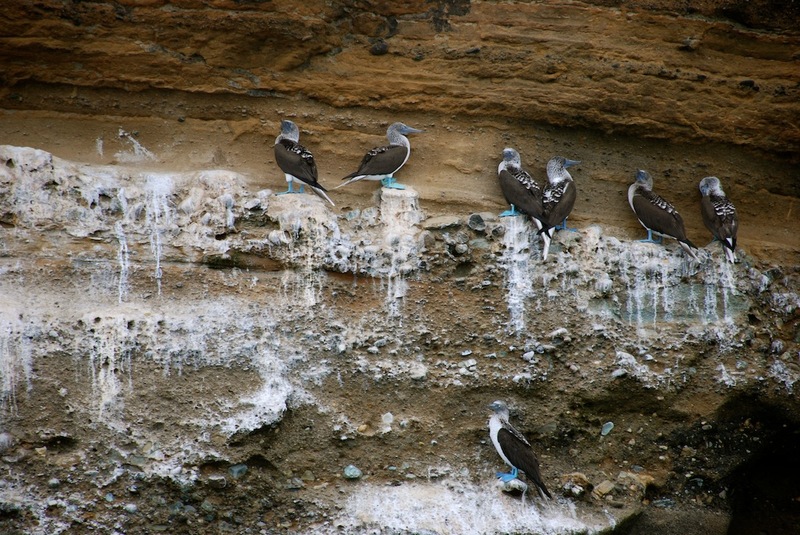 Throughout the day you should also get to see Blue Footed Boobies, Iguanas and reef sharks resting in the bays that they enter and exit during the high tide. Whilst on the island you must make time to do the 40 minute walk to Tortuga Bay! 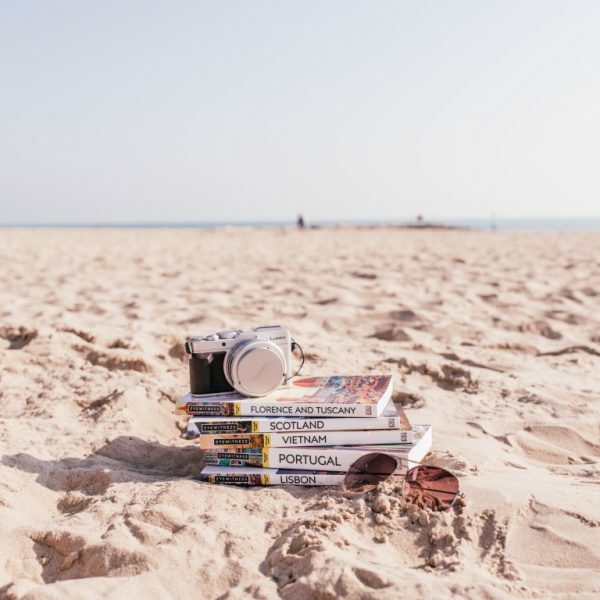 You will be rewarded with crystal clear blue seas, baby black tip reef sharks swimming in the shallows, lots of iguanas snoozing on the beach and some good surf waves. 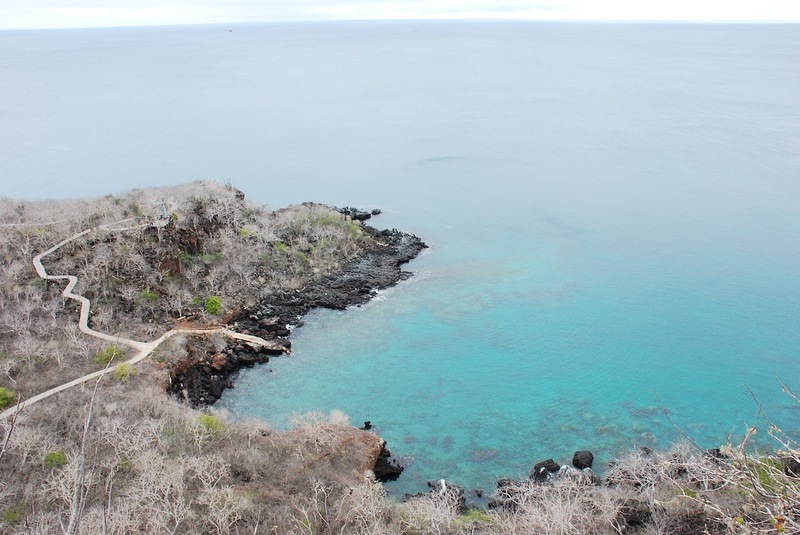 Walk all the way to the end of the beach and round the corner you will be able to snorkel and kayak. Make sure to bring some water and any snacks as there is nothing available at the beach. From Santa Cruz we took a morning boat ride over to San Cristobal. There are also boats leaving everyday to Isabella and the other main islands for around $25 – $30. 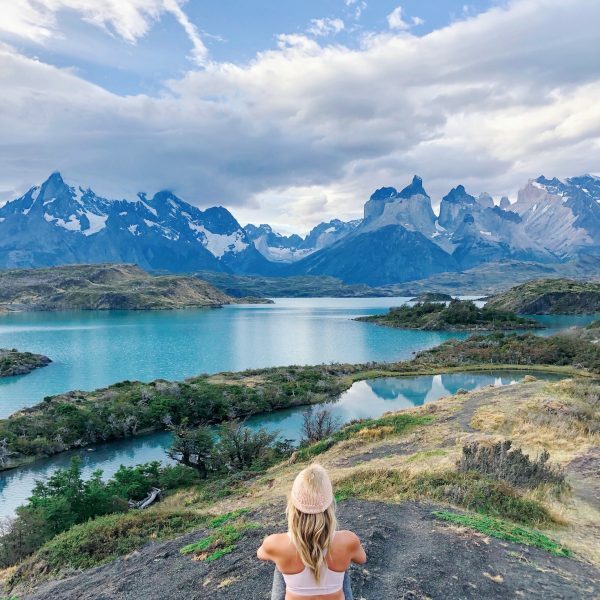 Since we were seeing a lot of the islands whilst diving we decided to base ourselves on just Santa Cruz and San Cristobal, there is plenty to do on and from these islands but you could spend a few days on the other islands too. 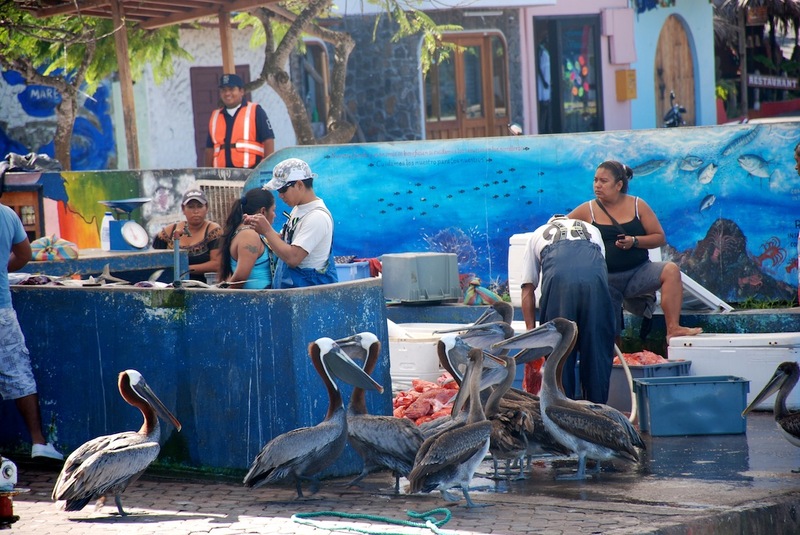 San Cristobal is a quieter island with less restaurant options versus Santa Cruz. But the island is beautiful and there are plenty of activities to keep you busy. We chose Casa Playa Mann which is a little out of town, but just a few minutes from the Interpretation Centre and Playa Mann Beach. The hotel was great and better than the images on their site. 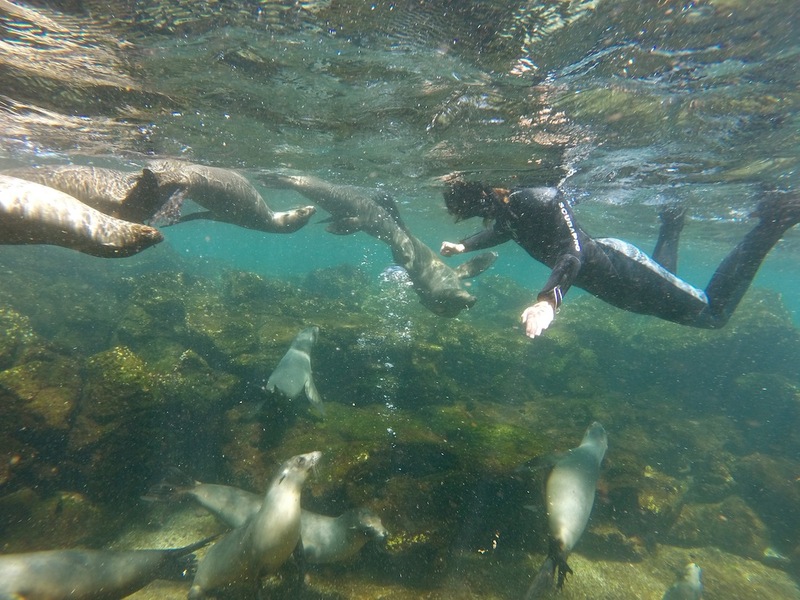 The hosts are extremely helpful and friendly and will loan you snorkel gear if you want to have a dip with the sea lions. Playa Mann Beach Head here during the day or even better to watch the sunset with the sealions who spend the days playing in the shore and lounging on the beach. 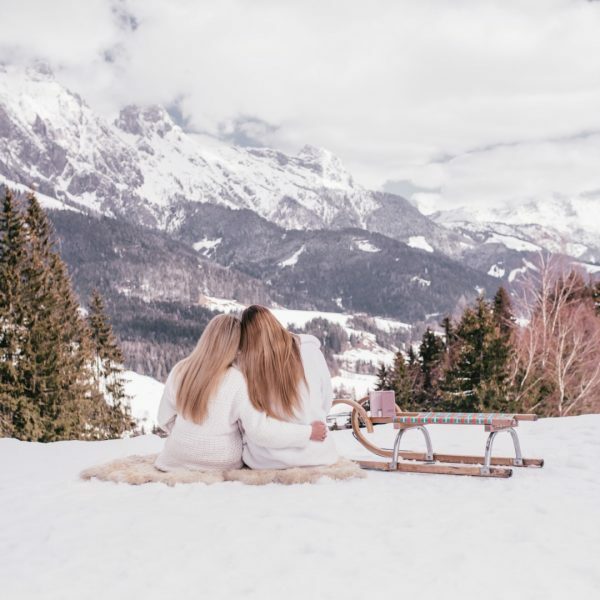 Take a picnic and a bottle of prosecco to really enjoy it! Interpretation Centre and Cerro Tijeretas Close to the hotel we were staying at is the Interpretation Centre. Head here to learn more about the history of the Island and then make your way to the walking trails to Cerro Tijeretas. This is a moderate uphill walking trail where you will be rewarded with some beautiful views over the ocean. Having just completed our Padi Open Water certification in Montanita, Ecuador we were keen to get back in the water! 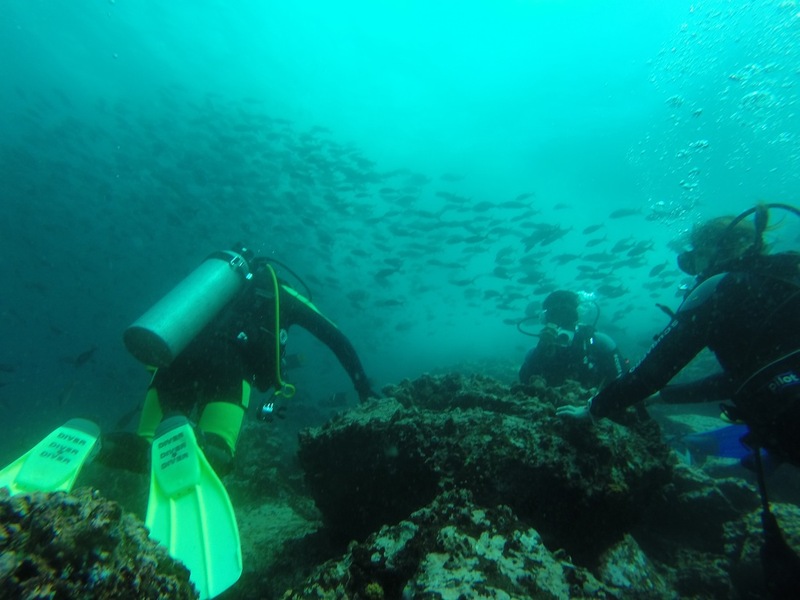 However, we had heard many stories that the diving in Galapagos required you to be an advanced diver with over 30 dives under your belt. Whilst this is true if you want to go out to some of the more remote dive spots to see whale sharks and schools of hammerheads you can still enjoy the aquatic life and get up close with some sharks as a newbie to diving. 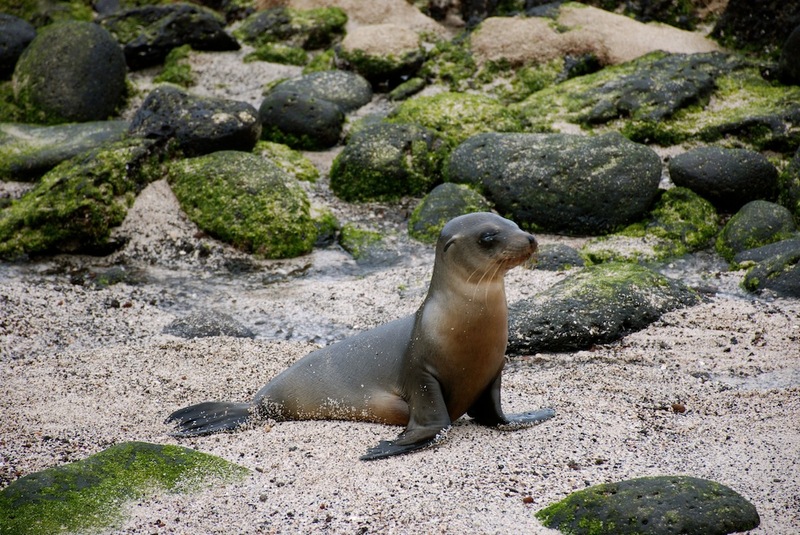 From Santa Cruz we did four dives with Galapagos Divers, who I cannot recommend highly enough. The team here were super professional with all of our kit prepped the day before the dives so no rushing around at 6am to find a wetsuit that fits! At the centre they provide tea and coffee and give you a brief on the dives you will be doing that day and what you might expect to see. They take the time to do this again on the dive boat before each of the dives. Our dives were over two days at Mosquera and El Canal. Wow! 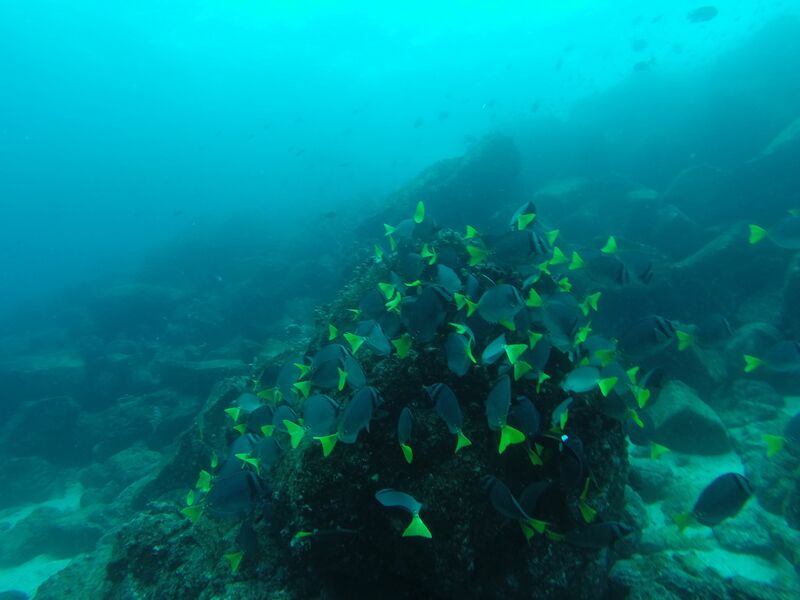 On our first entry to the water we were welcomed to the Galapagos with huge schools of colourful fish. 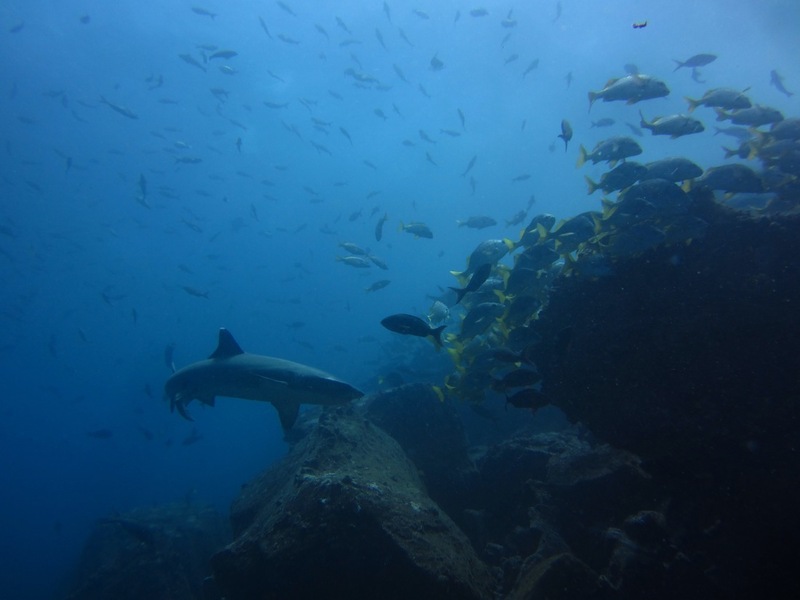 Once we had navigated ourselves past them and down to around 20 meters we were immediately met with several reef sharks calmly resting in the caverns and chilling at the bottom of the ocean. On our dives we were lucky enough to see groups of Eagle rays, sea turtles and even the Hammerheads that we thought we would only see if we made it to Gordon Rocks. Lunch! After all that diving we were ready to eat and thankfully Galapagos Divers provided us with a hot lunch at the end of the day which was honestly as good as eating at a restaurant, coupled with hot drinks, juices and fluffy white towels to warm us up! We were very tired but satisfied divers! Once back at the centre the dive masters take the time to help you complete your dive log, identifying all the sealife we had seen on our dives. 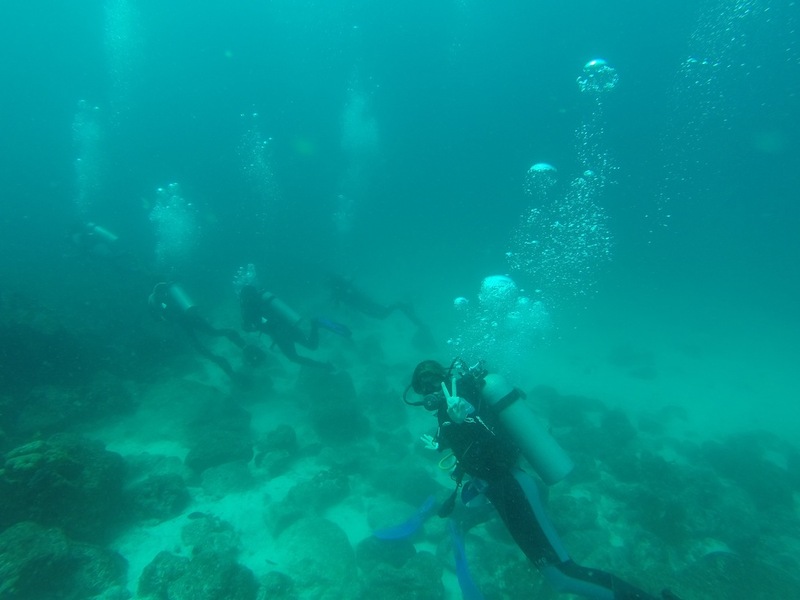 The other dives we did were at Punta Commorant, Champions, Wizard Hill and Kicker Rock. Kicker Rock was probably the hardest dive we did in the Galapagos. On the day the conditions were bad, visibility was only a meter or two ahead, the current was very strong and of course the water was freezing so I got through my tank of air a lot quicker than usual! On our dive boat there were only three divers and everyone else was snorkelling, at the end of the dive we found that the snorkelers had seen large groups of sharks and other sea life and we hadn’t seen anything at all! So save the money on this one and just go for the snorkelling option! 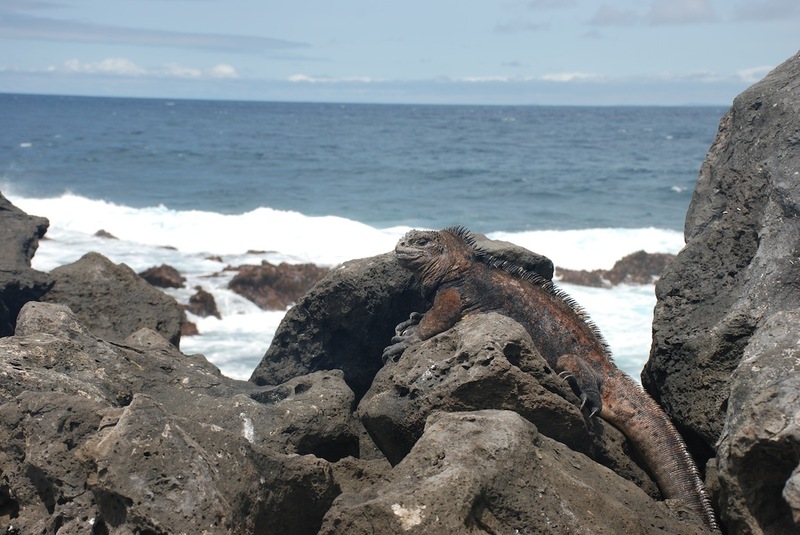 I hope that this article has inspired you to visit The Galapagos, Ecuador. If you have any questions about Ecuador travel please leave these in the comments below. Thanks for sharing your experience! Really helping with my planning. When you did DIY activities like snorkelling, where did you leave your belongings? Especially those that aren’t waterproof. I was thinking of bringing along a backpack to more secluded areas so leaving my stuff in my accommodation may not be a feasible option.